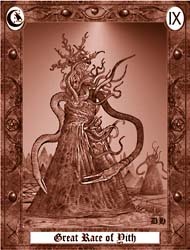 The Lovecraft Tarot is a tribute to the gothic writings of the visionary H.P. Lovecraft. It is the deck of choice for explorers of the macabre, and for posing questions that should never be asked. If you would like your own copy of the Lovecraft Tarot, you can buy it now!